From our signature collection. Vial holds the broken shards of glass from the wedding ceremony, preserving the memory forever in this beautiful mezuzah. 2" width/ 7" length About the artist: Gary Rosenthal has been sculpting in welded metals for over 25 years. Together with a team of talented craftspeople he has created one of the most popular and unique lines of Judaic art in the country. By combining copper, brass and steel with brillant fused glass, the Gary Rosenthal Collection has a contemporary style rooted in tradition. His inspiration comes from the rich history of the Jewish people which tells us it's a blessing, a mitzvah, to make beautiful, functional art. Work from this collection has been presented to Presidents from Carter to Clinton and celebrities as varied as Bette Midler, John Travolta and Tony Randall. Rosenthal's collection can be found throughout the worlds many fine gallaries, private collections, and the following museum shops: Smithsonian's Renwick Gallery, Corning Museum of Glass, American Craft Museum, B'nai B'rith Museum, The Jewish Museum, Skirball Museum of Culture, and the John F. Kennedy Center for the Performing Arts. From our signature collection. Vial holds the broken shards of glass from the wedding ceremony, preserving the memory forever in this beautiful mezuzah. 1" width/ 5 1/2" length About the artist: Gary Rosenthal has been sculpting in welded metals for over 25 years. Together with a team of talented craftspeople he has created one of the most popular and unique lines of Judaic art in the country. By combining copper, brass and steel with brillant fused glass, the Gary Rosenthal Collection has a contemporary style rooted in tradition. His inspiration comes from the rich history of the Jewish people which tells us it's a blessing, a mitzvah, to make beautiful, functional art. Work from this collection has been presented to Presidents from Carter to Clinton and celebrities as varied as Bette Midler, John Travolta and Tony Randall. Rosenthal's collection can be found throughout the worlds many fine gallaries, private collections, and the following museum shops: Smithsonian's Renwick Gallery, Corning Museum of Glass, American Craft Museum, B'nai B'rith Museum, The Jewish Museum, Skirball Museum of Culture, and the John F. Kennedy Center for the Performing Arts. 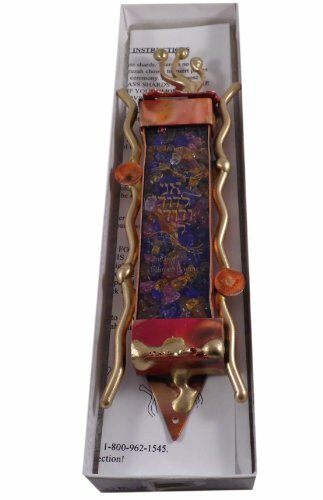 Artistic colorful glass mezuzah scroll cover by Gary Rosenthal. Size: 4.5"x1.5". Please allow 5 additional days for shipping. 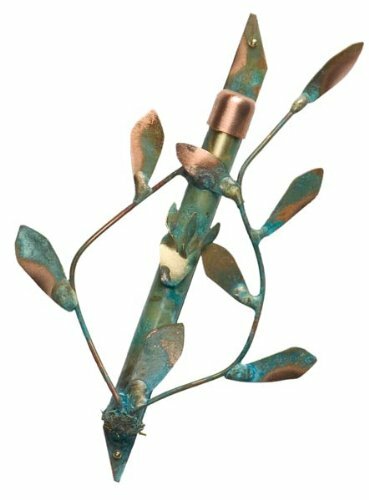 The Gary Rosenthal art collection - Copper Vine Mezuzah. A simple copper leaf design with green patina finish. Functional yet durable art by Gary Rosenthal. 5.5"x4". Please allow 5 additional days for shipping. Artistic woven wedding Mezuzah cover with a multi green finish. 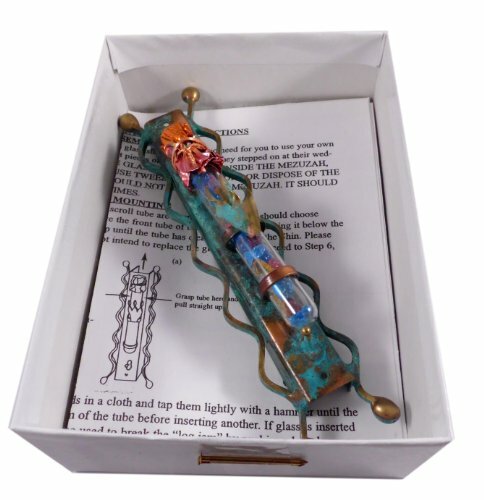 Displays a tube with wedding shards in it. .B y Gary Rosenthal . Size: H 5" x W 1"
Artistic metal and glass wedding Mezuza scroll cover with a heart. Comes with 2 tubes. One is for the mezuzah scroll and one is to hold your Chuppah cup chips. By Gary Rosenthal . 7" x 2"
This unique hand made woven copper mezuzah case by Gary Rosenthal features a space for your broken wedding glass! Made with Gary's special woven copper with brass accents, this piece does not include the mezuzah scroll, but will hold a 6 cm parchment scroll that is sold separately. Handmade, each one is a unique creation and will vary slightly from example shown. No need to send the item to be filled, simply empty the included glass shards from the tube and fill with your own broken glass! You have the option of either adding to or replacing these with your own broken wedding glass to commemorate your special day. 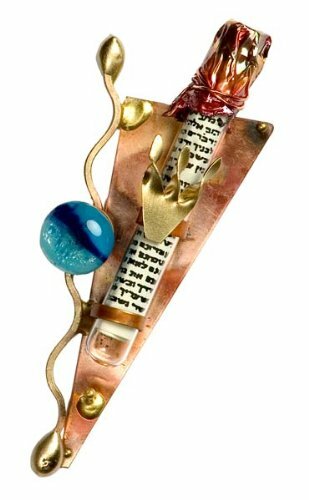 Mezuzah Cover Copper Gary Rosenthal Art 6"x1.25"
Gary Rosenthal Judaica MIXED METALS MEZUZAH RARE ONE OF A KIND! 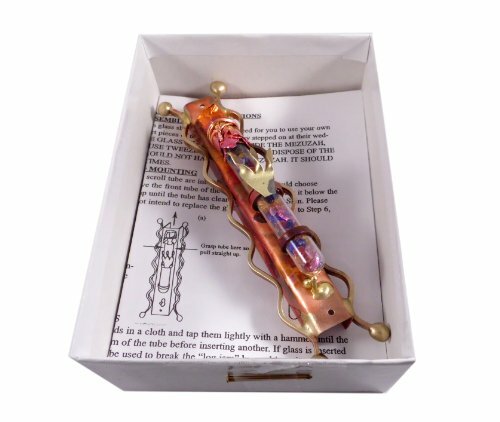 View this Gary Rosenthal Wedding Mezuzah at: http://www.jewishgiftplace.com/Gary-Rosenthal-Broken-Wedding-Glass-Collection-Heart-Mezuzah-with-Single-Tube.html. Want more Gary Rosenthal Mezuzah similar ideas? Try to explore these searches: Women Humor Womens Cap, Mahogany Height, and Bigger Disk.